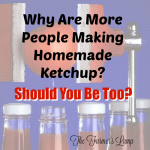 Why Are More People Making Homemade Ketchup? Should You Be Too? I was a grown woman before I realized I liked ketchup. I had always been told I was allergic to it because it gave me mouth ulcers. When I became a nurse, I found out ketchup was not the culprit so I decided to try it. I liked it. Not as much as the rest of my family, I have to be in just the right mood for it but the guys love it, especially homemade ketchup! Ketchup is something most of us grew up using and was a mainstay in the refrigerator. Did you know it was brought here from China by British merchants? It was first used a fermented sauce for fish. As a fermented food, it was naturally good for the body. Ketchup sold on the grocery shelves today is far from the fermented, healthy, homemade ketchup recipe it started out as. Not to shock you, but have you actually read the label on your ketchup bottle? The ingredients on food labels are “supposed” to be listed in order of amount in the product. 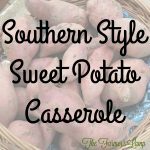 The first ingredient is the most used, the second the second most…. I make my homemade cranberry sauce with organic, non-gmo ingredients. You can use conventional ingredients if you don’t subscribe to the organic lifestyle. What would the holidays be without cranberry sauce? The turkey, the dressing, the crescent rolls, they would all be missing the flavor blast of delicious cranberry sauce. The smell of homemade cranberry sauce wafting through the air fills your home with comfort and seasonal good tidings. It’s time for making pickles! The cucumbers are coming in as fast as the zucchini! I don’t know about where you are, but here in the deep South, it’s very hot. I don’t want to turn the stove on and the outdoor kitchen isn’t up and running yet. 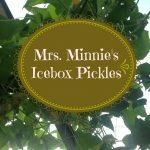 That’s just one more reason for me to pull out the recipe for Mrs. Minnie’s Icebox Pickles. There’s no cooking (except to heat the liquid) so my kitchen doesn’t get hot. This pickle recipe is easy, delicious, and sweet.